Photo copyright by Yvonne Vendgas. 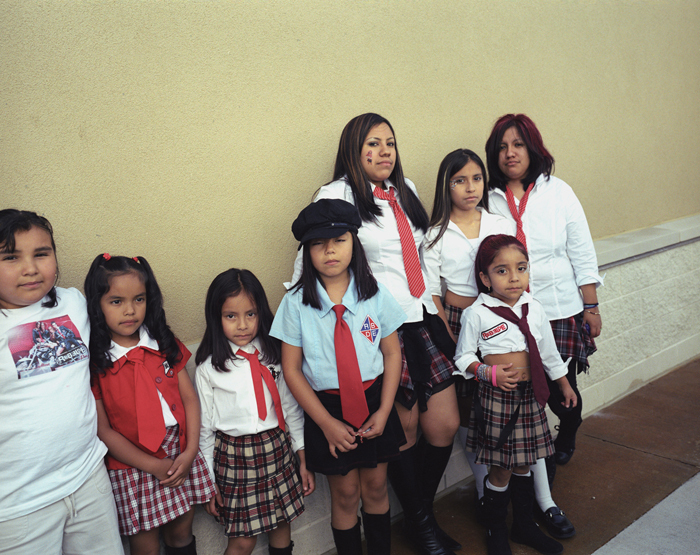 Shoshana Wayne Gallery is pleased to present a solo show of photographs by Yvonne Venegas. This is Yvonne’s second show with the gallery. Venegas continues to investigate the notion of portraiture. This practice was instilled in the artist through the work of her father- a photographer who captures various social events in the Mexican city of Tijuana. As a youth, Yvonne began her exploration of capturing images through photographs that she took of her twin sister Julieta, now a famous pop singer in Mexico. For her current exhibition, the main gallery features 16 images taken from a body of work titled “Inedito”. Yvonne was on set for select sessions of filming the third season of the Mexican telenovela “Rebelde”. Most of the images are taken either at Televisa San Angel Sound Stage 3, on location at Royal Forest country club or live at concerts in the US. The telenovela follows a group of students from an elite academic institution, as several students create a band. The fictional band created for the show became a national sensation and performed live concerts to thousands of fans around the world. It is this particular notion of blurred reality that fascinates Venegas. In her images, it is often unclear what is a set, and what is reality. A few images focus on the fans of the band, who seek to emulate the band members by mimicking their school uniform. The irony of fiction juxtaposed with reality becomes crystallized in many of the shots she takes. The process of perception in understanding roles- who is an actor, what is real; is blurred even further in some images, as the subjects of some photos mistake Venegas for her famous twin sister and attempt to capture her image while she is taking theirs. On a larger social scale, the telenovela actors take on huge impact in the culture with their mass popularity. It is suggested that a few of the actors are paired with local politicians in real life as strategy to boost election votes for that candidate. Again fiction runs side by side with reality. In the smaller gallery, Venegas chooses a selection of photographs from a recent body of work “Gestus”. This series is currently in progress, and the installation hints at the unfinished nature of the work. In “Gestus”, Venegas builds what she calls a “documentary project about portraiture” by seeking anonymous subjects who want to be photographed as well as photographers for hire and other amateur photographers as they document their subjects. Yvonne Venegas has exhibited at Museo de Arte Contemporaneo de Monterrey Monterrey, Mexico; Museo De Arte Carrillo Gil, Mexico City, Mexico; San Francisco Museum of Modern Art, San Francisco, CA; Nerman Museum of Contemporary Art, Kansas City; Santa Monica Museum of Art, Santa Monica, CA; Museum of Contemporary Art, San Diego, CA; Museum des Beaux Arts, Orleans, France; Bozar Museu, Brussels. Venegas was the recipient of the Magnum Expression Photography Award in 2010 and is also featured in the first ever “Biennale Online”. Yvonne lives and works in Mexico City, DF.